Will the Reverend Silvia please bow? 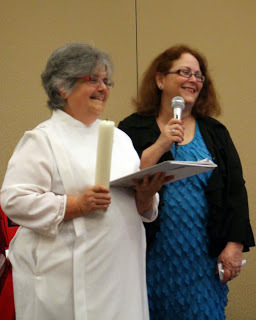 On Wednesday, May 13 I traveled to Tampa, Florida for the annual retreat of the Association of Roman Catholic Women Priests. I was to be ordained a deacon on Friday, May 15th and was also to participate as an interpreter for Martha Aida Soto Bernal, an ordained woman priest from Colombia. From the beginning, I was welcomed by the members of my new community of mystics and prophets who are working for social justice in the world. This is a wonderful group of women and men who live the qualities bestowed upon the apostles by the Holy Spirit at Pentecost, which was celebrated May 24th, 2015. The gifts of the Holy Spirit were shared and we are told in Galatians 5 to bear these gifts, which are love, joy, peace, patience, kindness, goodness, faithfulness, gentleness, and self-control. It is said that the apostles were transfigured and spoke in languages which they had not themselves learned. To me this is a call for an inclusive, multicultural, multilingual, multiracial, multi-gendered community, a true discipleship of equals. It is certainly not the community that we live in our current world. My journey to this place had been a strange mixture of joy and strangeness, of safety felt and shared and of fears that I will not be enough, that I will be found wanting. I know that God is within, but old habits and beliefs die hard, and I have much healing yet to do. But my sister Maria was there to introduce me, and I was wearing an alb that I had borrowed, looking much like an unlikely Roman citizen in this beautiful white robe, awaiting the stole of ordination. I had been working for days on NOT CRYING. I grew up at a time and in a place that did not welcome tears, and I did not start actually crying until I was in my forties. As the days go by, the tears seem to come ever more quickly, so I was doing careful breathing, small inducements to myself NOT to cry. When the Bishop laid her hands upon my head I felt the tingle of inner tears; with the book, they were lined up at the door, waiting to be let out. 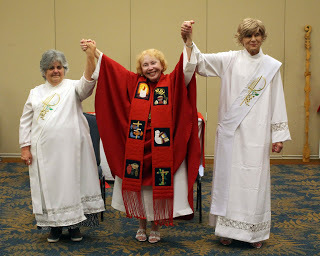 When we were finally ordained, Jeni and I the two newest deacons, I could no longer hold them. The rest of the retreat was both wonderful and anticlimactic. We had meetings and a sharing of experiences, and we sat with the six candidates to the bishophric, and we were truly one. Two of those days it seemed as though my recent bout of cellulitis had returned, and I had both prayer and Reiki done by various of my sisters. Then Sunday after it was all over we were driven to Treasure Island by one of our brothers. I kept looking at the beautiful waters of the Gulf of Mexico, and thinking that this is the same water that bathes the beautiful island where I was born… and I went swimming, and left behind all illness and diseased skin. I have returned renewed and ready for the next experience the divinity has in store for me. This entry was posted in Uncategorized and tagged brothers and sisters, evolution, tears, Teilhard de Chardin, women's ordination. Bookmark the permalink.